I’m starting a new job as a Data Visualization Manager in August. And I need to get my chops up and JFDI. I was hired more on potential based on an unusual a skill set combination more than raw pre-existing Data Visualization skills and experience. I’d done some previous work in Data Visualization working at a Research Assistant at the USC Annenberg Innovation Lab doing exploratory data analysis studying Soccer Fan Behavior and in a Techniques of Information Visualization course at USC. I also have some programming skills from attending Hackbright Academy prior to getting a Master of Communication Management at USC, which I recently finished. Before school, I’d work for five years in Silicon Valley in a variety of roles in the start-up, ad agency, and corporate spaces, but mostly focused on digital marketing. I developed a high understand of how the business works and the technical challenges involved. I was hired, and I’m paraphrasing some of their words, for the rare combination of previous business and technical acumen in the digital marketing space, some hacking skills, and a critical understanding of advertising, communication, and data from graduate coursework and working as a researcher. I’m extremely happy to get back into digital marketing, it’s a space I’d like to stay in, and I’m extremely excited for my new role. However, I’m definitely need to bridge the gap in many ways, transitioning back into a full-time role from working as a graduate student and researcher. Also, while this is not a field change, but it is definitely a career change. The too obvious issue here for me is that I while I’ve been hired to manage data visualization and creation processes, I currently can’t build sophisticated data visualization on my own. I’m happy and extremely capable of working as product manager type, but I also want to be more deadly than that. I’ve just not been satisfied with my coding skills. Unlike my follow Hackbright graduates, I didn’t become and don’t want to become a full-time Software Engineer. For me, it’d be a pay cut, and my skill set combination is what I bank on and enjoy deploying. However, the coding is more weaker than I’d like simply because of time constraints and an honest lack of interest in projects I want to build. This is now the perfect opportunity to improve and do something I’m extremely interested in and would enjoy doing. 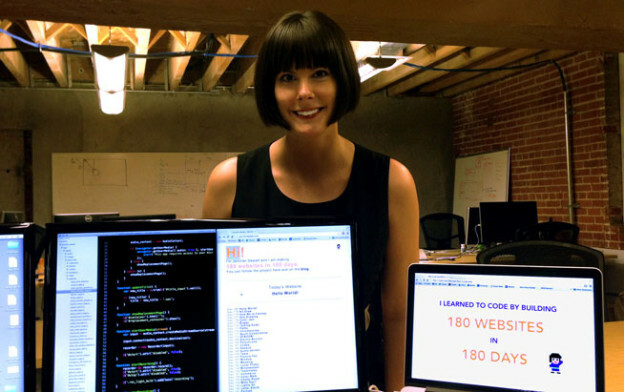 When I was learning to code, I came across Jennifer Dewalt’s 180 Website in a 180 Days. She mentioned how she just needed to JFDI. I feel the say way. I’m going to do a more modified version. I need to do one or more of the following for the next 180 Days straight, with an ideal of all. This is forcing me to essentially JFDI. Present a new Data Visualization and walk through it or show improvements on a previous project and walk through it. What does not work well and what would I improve? What is the data source? Do I see any problems with how it’s cited/used? Any other comments about what I learned? This entry was posted in data visualization, learning and tagged data visualization, data viz, jennifer dewalt, learning by bessiechu. Bookmark the permalink.